Goals in either half from Courtney Duffus and Paul Keegan gave Waterford a deserved 2-0 SSE Airtricity League Premier Division win, but it could have been a different story at the Markets Field on Good Friday had Limerick taken their first-half chances. The Shannonsiders should have been ahead past the quarter-hour when Shaun Kelly’s quick-thinking put Will Fitzgerald in on goal but Lawrence Vigouroux came to Waterford’s rescue with a good block. That was the turning point of the game as the visitors hit the front shortly after, Courtney Duffus taking full advantage with a clinical finish after Limerick sloppily gave up possession. Vigouroux produced heroics seven minutes before the break when captain Shane Duggan looked certain to score. And Limerick were lucky not to go in two down as Gavan Holohan got clear on the stroke of half-time but he pulled a shot badly wide. Waterford would go on to control the second half and, after both Holohan and Duffus went close, they eventually wrapped up the points late on when Paul Keegan buried an 84th-minute penalty. For the game, Limerick manager Tommy Barrett made one change to the team that narrowly lost out to Saint Patrick’s Athletic on the road a week earlier, as Henry Cameron was replaced by Barry Maguire. There was also a change of formation for the Superblues to 3-5-2, with Shaun Kelly and Billy Dennehy acting as wingbacks while Fitzgerald partnered Connor Ellis up front. Early on, Duffus tested Brendan Clarke with a low strike which the ‘keeper held well. But the first real chance of the evening fell to Limerick and Fitzgerald on 18 minutes. Ellis won the foul but it was Kelly’s quick reaction which set the youngster free on goal, a good first touch setting him for a shot but Vigouroux made a smart block to deny him. As Limerick started to get on top, Duggan’s drive from outside the box was saved by the Waterford stopper. However, against the run of play, the RSC club had the lead on 23 minutes when Duffus fired a bullet to the bottom corner, after Limerick had sloppily conceded possession. On 38 minutes, Barrett’s team somehow failed to find a deserved equaliser. Ellis pulled it back for Duggan in the centre and his shot looked certain to find the net only for Vigouroux to produce a fantastic save, with Limerick unable to follow up with a rebound from a tight angle. At the end of the half, Waterford could have doubled their advantage when Holohan was put through on goal but with just Clarke to beat, the midfielder dragged his effort badly off target. At the break, Killian Brouder was called upon to replace Darren Dennehy. But Limerick struggled to make inroads after the restart. On 56 minutes, John Kavanagh’s deep cross from the right was met by Holohan at the back post and from tight angle he managed to direct the ball goalwards only for Clarke to get across well and knock it away. Midway through the half, Duffus robbed the ball deep in Limerick territory and was in on goal, but a weak effort was easy for Clarke. The game, though, was put to bed six minutes from time as Keegan hammered to the net, after substitute Ismahil Akinade had been fouled in the area. Limerick: Brendan Clarke, Shaun Kelly, Kilian Cantwell, Tony Whitehead, Darren Dennehy (Killian Brouder HT), Billy Dennehy, Cían Coleman, Barry Maguire (Karl O’Sullivan 61), Shane Duggan ©, Will Fitzgerald, Connor Ellis (Jeff McGowan 78). Booked: J McGowan (78), T Whitehead (83). Unused Subs: Tommy Holland (GK), Henry Cameron, Shane Tracy, Colm Walsh-O’Loghlen. 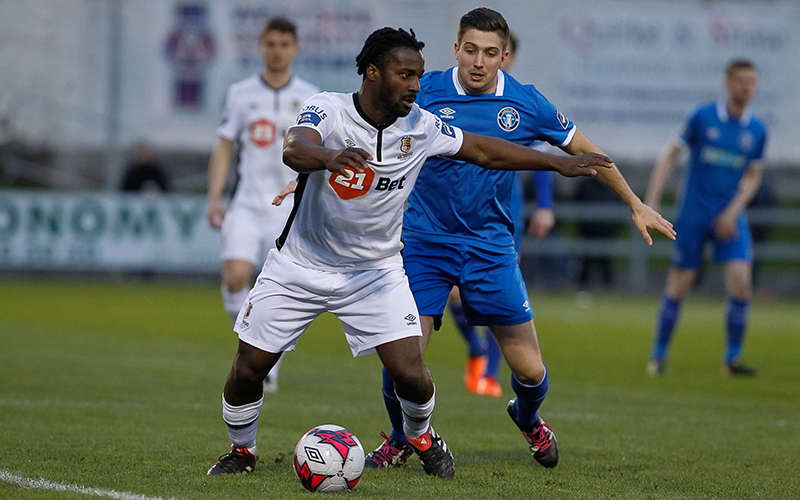 Waterford: Lawrence Vigouroux, John Kavanagh, Kenny Browne, David Webster, Stanley Aborah, Dylan Barnett, Paul Keegan ©, Gavan Holohan (Derek Daly 89), Bastien Héry, John Martin (Ismahil Akinade 65), Courtney Duffus (Sander Puri 83). Booked: None. Goals: C Duffus (23), P Keegan (84 pen). Unused Subs: Niall Corbet (GK), Dean Walsh, Garry Comerford, Faysel Kasmi. Referee: Tomás Connolly (Dublin). Attendance: 1,122 (Official).